Well, actually it was "came to Lewis County". In the category of paying credit where it's due, we need to recognize Neal Aldrich as the pioneer who brought blueberries to Lewis county and, specifically, to Mossyrock in about 1940. Dad, born in 1899, did not finish high school, but that was not too unusual in the pre-World War I years. He was, however, a hard worker, a prolific reader, was incessantly curious, always experimenting with new plants, held a great respect for the land, and loved to farm. Mom, (Marjorie Huntting Aldrich) was teaching in Mossyrock, commuting daily from their seven acre parcel in Silver Creek - a hillside parcel on Democrat Hill. She began to tell dad about the great soil here in the Mossyrock Valley (then referred to as the Klickitat Prairie). He was soon convinced and they were able to buy 20 acres, which is now a central part of Aldrich Berry Farm & Nursery. That was in 1933. They sold in Silver Creek and moved to Mossyrock. By 1940 or 41 Dad's curiosity and search for a more high value crop than hay & grain led him to plant about a dozen blueberry plants in our garden. In a couple years we began having nice, plump, juicy blueberries! 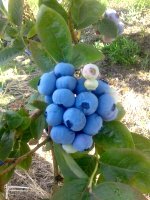 That started a 'Blueberry revolution in the Klickitat Valley." It looked like blueberries was something that "Mom & the kids could do in the summer" to supplement our income. Little, did we know! In the fall of 1944 we planted our original one acre of blueberries. We couldn't get enough plants that fall ( everything was 'rationed' as "there's a war on, you know") so we had a good friend of the family buy some and we bought them from him and planted the rest of our original 1 1/3 acre in the spring of 1945. These plants are still, after 69 years, in production. The blueberries that Dad & Mom planted were not only the first blueberries in Mossyrock, but also the first commercial blueberries in Lewis County. Later, came a small field near Napavine (ca late '40's), about 12 acres by Everett Tichnor northwest of Centralia (ca 1950) which is still in production, the Anderson planting at Mossyrock (1952) now over 100 acres owned & operated by Pan American Berry Growers, and a small field by Frank & Alice Grose at Mossyrock (ca 1952) which has grown to about 15 acres, and a small field by Frank Hamilton (ca 1954) now gone to commercial development. Now, about 140 of the 155 acres of blueberries are grown on Mossyrock silt loam. As it has evolved, Mom's observation that Mossyrock silt loam was "really good soil" has proven to be true. In the summer of 1950 we hired 25 hand pickers and produced 20,800 pounds of blueberries. The "something for Mom & the kids to do" turned out not to be picking but hoeing, cleaning, packaging, and marketing. We added acreage at various times, particularly in the early-mid 1960's to grow to the present 26 acres we now have and are adding onto. As chronicled in How Blueberries Came to Mossyrock the industry began with the original 1 1/3 acre planting by Neal & Marjorie Aldrich. That acreage is still in production. Both the PanAm(Anderson) farm and the Grose acreage began in the early 1950's. In the 1940's and 50's there was no chemical weed controls that were selective (i.e., would kill the weeds but spare the blueberries). Mechanical controls were by hoeing, hand pulling or tilling with either discing or cultivating with a chisel or sweep. All of these methods were likely to be detrimental to good blueberry growth & production. Because blueberry roots are very shallow and wide spread, mechanical weed control easily damaged their roots. Also, the frequent tilling broke down soil tilth, disrupted the natural biotic activity of the soil and stood to deplete the very high 20% natural organic matter of Mossyrock Silt Loam. (Most Western Washington soils contain about 4 % OM). The high organic matter has enabled Mossyrock silt loam to be a superior soil for growing blueberries. Mechanical weed control would not have been sustainable; the advent of selective weed killers allows us to avoid the expensive (expensive, in several respects) mechanical control and provide for sustainability. In about 1952 irrigation for blueberries in Mossyrock made its debut. Overhead irrigation was used, almost exclusively by both Anderson and Aldrich with only a small experimental effort of drip irrigation being done at Aldrich Berry Farm in about the 1980's. In about 2006, drip became the primarily means at the PanAm (Anderson) farm. Pruning has evolved from rather heavy pruning to light, and now back to more aggressive pruning. One thing that can be said for our Mossyrock blueberry farmers is that they learn from doing and modify their methods accordingly. We have learned the valued of bees for pollination. At first we believed that bumble bees were the "only" way. In the early 1960's research showed that honey bees were superior. Nowadays, hiring bees for pollination is essential. Likewise, spraying for insects and disease has evolved. For the first nearly-20 years nothing was needed. Then, as diseases and later, insects found our fields we began applying more chemicals in order to protect our crop. These materials are expensive, but the specter of reduced production, and with the support of research, we are able to be as judicious as possible, yet protecting the safety both our workers as well as our customers. Harvest has evolved from 100% hand picking to a combination of hand picking and mechanical harvesting. We began experimenting with mechanical assistance in picking in about 1960 and have progressed through the several stages of mechanical picking development to, today, when we harvest about 75% of the crop with three or four men. Mechanically harvested blueberries has traditionally been used only for fruit to go into the processed (frozen) line of products, but we are making in-roads into picking mechanically for fresh sales. The most elemental mechanical assistance equipment can be purchased for a few thousand dollars, but modern machines cost more than $100,000. In the early years, we got about $.25 - $.35 per pound and paid pickers about 20% of that. Today, we pay about $.40 or more per pound and sell for about $.65 to $1.95 depending on the market, (processed vs fresh). This equates to about 25% to 60% of the price of the fruit going into hand harvest. Mechanical harvest costs are a fraction of hand harvest, but with the use of the machine we can harvest varieties and final pickings that hand harvesters would not be interested in picking. 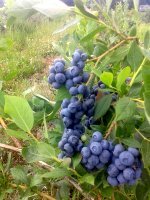 Blueberry producers in the Mossyrock area were also instrumental in developing the blueberry promotion and marketing efforts in Washington state, and nationwide. Dad was an instigator in the late 1940's - early '50's of the Washington Blueberry Growers Association, a farmers' cooperative. He served on their Board of Directors for a number of years, as I also did. It was a bargaining organization and we hauled our fruit as far as Kenmore (Seattle area) and Vancouver WA to get them processed. In those early years, processing of blueberries was a problem as most processing companies did not know how nor did they have equipment which they thought would do the task, plus there was little development of a market for the fruit. Sale of the fruit was always an issue. At our farm, we began selling fresh direct to neighbors, then via the traditional fresh market hallocks and flats, first to Fullers Market Basket in Chehalis. The fruit for processing (freezing or canning) was hauled long distances to processors. We began to clean, package, and freeze at local locker freezers a portion of our processed fruit and selling as far away as Yakima and Spokane. We developed a fresh fruit sale packaged in 1lb polybags. These do-it-yourself tactics were not able to keep up with the production volume and the Cooperative was operating rather ineffectually, so we began a corporate effort with the Drew farm at Rochester. When my wife, Wisten, & I returned to the farm in 1963, we were instrumental in organizing processing and sales with the Drew farm at Rochester and with the Anderson farm here in Mossyrock. That group of growers formed Producer Marketing Company (PMC) which processed and marketed our fruit along with growers from northern Washington to southern Oregon. That organization evolved out of existence in 2006, being absorbed by a multinational marketing consortium. I served on the Board of Directors of PMC for about 20 years. Out of that group of growers grew the Washington Blueberry Commission, which formed in about 1967 and on whose Board I served for 12 years. Members of the WA Commission fostered the North American Blueberry Council which organized in about 1972. Today, we continue to sell as many berries direct from the farm and via other fresh channels as possible. This aspect of the Mossyrock blueberry industry has not particularly evolved. Processing of most of the local berries is currently done at a very modern plant that handles several million pounds a year and is located near Woodland, Washington. Because of the advantages of soil and irrigation blueberries are likely to continue to be a crop in the Mossyrock area for many years to come. was a slogan from the days of the Washington Blueberry Growers Association. ...Still appropriate today as the volume of blueberry fruit in the world is increasing very rapidly. We welcome you to come by and try them ..."Good & Good for You!"